I'm catching up on a month's worth of projects -- this is the second entry of the batch. Last month, I was nearly finished with a jeans-style jacket (McCall's M5191) that I had started after taking the Pattern Alterations & Adjustments classes back in February and March. 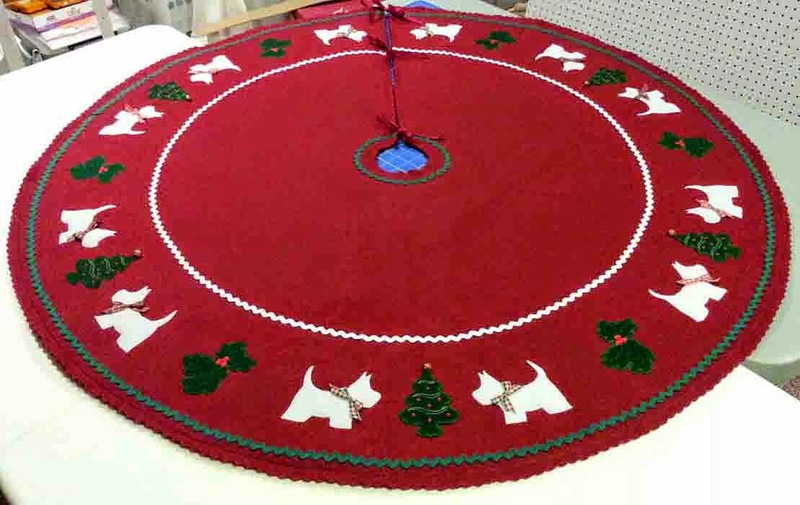 I had only the collar and facing left to attach, then buttons and buttonholes to complete. I am happy to report that I finished the jacket, buttonholes and all and have been wearing my jacket for about 2 weeks now. I did run into some problems with the buttonholes -- I wanted them to be a keyhole shape, and every sample buttonhole I stitched on my scrap fabric turned out perfect. When I tried to stitch them on my actual garment, something went awry and they turned out crooked and warped. I think the problem may have been that I did not take into account the seam allowance where the jacket front meets the facing when I stitched my samples; I had duplicated the thickness of the fabric on my scrap pieces, but not that seam. It seemed that my buttonhole foot kept getting blocked by the bulk of that seam and I didn't get my nice keyhole shapes. After picking out 3 or 4 lopsided buttonholes, I settled for regular buttonhole shapes. I am going to try the keyholes again next time, but I'll do a better job of trimming the seam and spacing the holes from the edge. I found real jean-style buttons in the notions section at JoAnn Fabrics and attached them using a hammer (as directed). 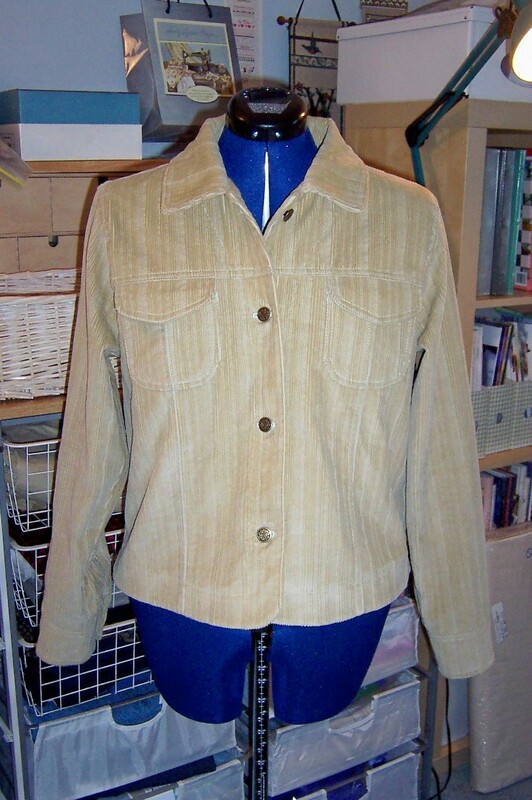 I think the jacket turned out pretty well for a first try and I'd like to make another one soon, but in place of the corduroy fabric, I'd like to use a lighter weight denim. 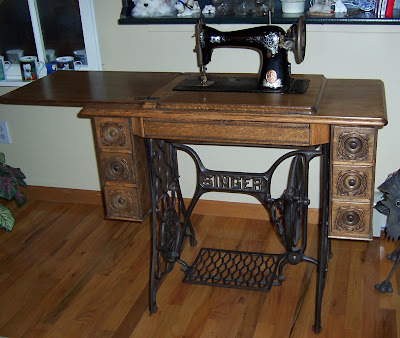 And, I'd like to embroider some design across the back yoke. 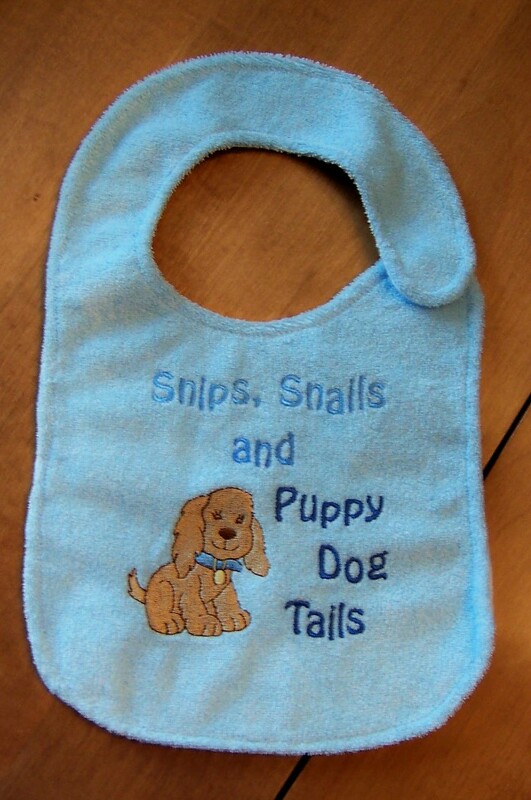 Another project on my To Do list was a set of baby bibs for some of the newest additions to the family. 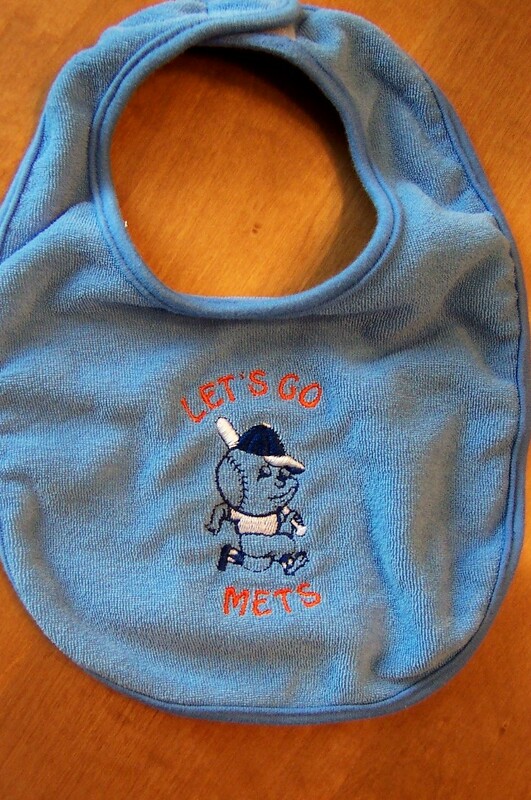 I wanted to embroider a few Mets bibs and used a design combination I came up with last fall when I was making fleece hats and scarves. The design is called Running Baseball, purchased from Embroidery.com, and I added the letters using 4D Embroidery. 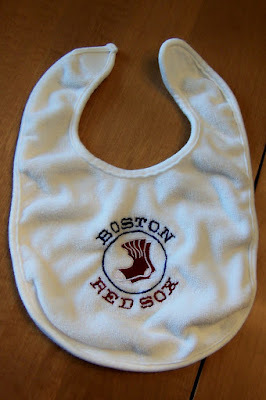 The bibs were purchased as part of a 10-pack of plain bibs at Babies R Us last year; I'm just embroidering the design. I used polyester thread for these designs (in place of rayon), hoping it will stand up to many washings. I'm also experimenting with some new iron-on cut-away stabilizer, which I ironed over the back of the embroidery. Okay - before I get any complaints, I know there are also some (misguided, IMO) Yankee fans in the family, too. I didn't make any Yankee bibs, partly because I couldn't find a suitable design (similar to the sox or the running baseball) and I'm not really inspired to create a replica of the Yankee logo. And, I'm just not experienced enough to digitize it satisfactorily yet. Maybe next year . . .
What's up next? Well, I've got a couple of projects in the works. I owe a couple of backpacks/quilted bags to various people and I'm working on another soft book of embroidered appliqué designs (these are purchased designs; I'm only adding the words and assembling the book). And I need to spend some time with the upgrade of the 4D Professional embroidery design software (more on that in my next entry).